Theo Genn and Asirea Fortuna led the way in the 1.30m Open Jumpers. Photos by: Kendall Bierer/Phelps Media Group. Wayne, IL – June 18, 2014 – For the Genn family, the Showplace Spring Spectacular series is a family affair. Kicking off the second day of the third week was Theo Genn with Asirea Fortuna in the $2,500 1.30m Open Jumpers, sponsored by Canterbury Farms, taking the victory in 27.626 seconds. Shortly after, Wilhelm Genn rode to the top of the leader board in the $2,500 1.40m Open Jumpers, sponsored by ROC USA and Julie Novak, in 34.516 seconds with Happy Z. 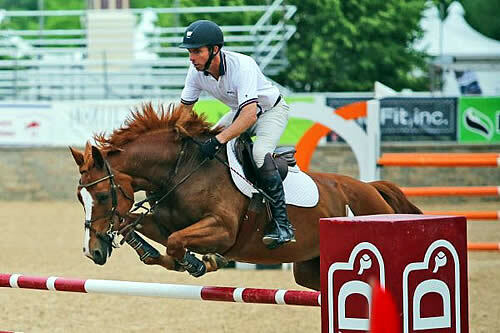 The LUXMAX U.S.A. Grand Prix Ring at the Lamplight Equestrian Center transformed back into the premiere show jumping facility, making it hard to believe that one of the most prestigious derbies in the nation had taken place less than 24 hours prior. Entering into a race against the clock, 25 riders faced off in the $2,500 1.30m Open Jumpers, sponsored by Canterbury Farms. Megan Moshontz-Bash was the first to take on the morning’s track. She guided Pourkoipa Fontaine, owned by Cleveland Equestrian, to a double clear round in 29.152 seconds. Andrew Kocher and Coco 135 fell just shy of her time, crossing the timer in 29.332 seconds. Theo Genn and was the only contender who could catch Moshontz-Bash. He took a more conservative approach to the jump-off with Asirea Fortuna, owned by Eduardo Leon, but their large stride and forward pace proved enough to take over the lead. Theo broke the beam in 27.626 seconds to take over the lead and eventually the morning’s victory. “Even though she is only 8 years old, we have won a grand prix and come in second in another. This was really a schooling class for her, and I knew that I didn’t want to push her too hard with the grand prix approaching this weekend,” Theo stated. With thunderstorms on the horizon and clouds billowing over the Lamplight Equestrian Center the $2,500 1.40m Open Jumpers, sponsored by ROC USA and Julie Novak, got underway. Riders were racing against the unwelcoming elements, as well as the clock as they moved through the obstacles in an attempt to best the next. Theo continued with his winning ways, attempting to duplicate his earlier effort. This time he rode Aniviero Z, owned by Amy Lefferdink, to a double clear round in 36.223 seconds. It seemed as though his time might hold, but speed demon Lisa Goldman took over the lead with Rocs to Riches in a timely 35.546 seconds. It seemed as though Goldman would take the win on the opening day for her third consecutive week, but Wilhelm Genn had his eyes set on the 1.40m win. He rode Happy Z to a clean first round, and then as the wind picked up, so did Wilhelm’s speed as they cleared the 1.40m short course in 34.516 seconds. The jumper action will continue in the LUXMAX, U.S.A. Grand Prix Ring tomorrow when the $20,000 Open Welcome Stake, sponsored by Upper Echelon Academy, will take the center stage. 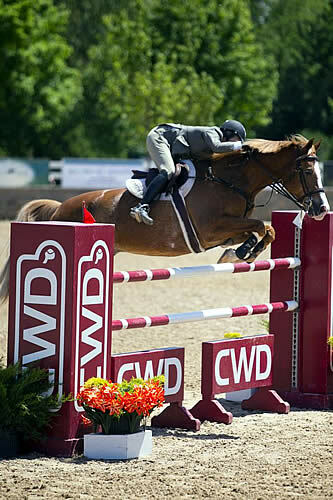 Riders will also have the opportunity to show in the Young Jumper Championship classes, with the unique chance to compete without entry fees. For more information, please visit: http://www.showplaceproductions.com. 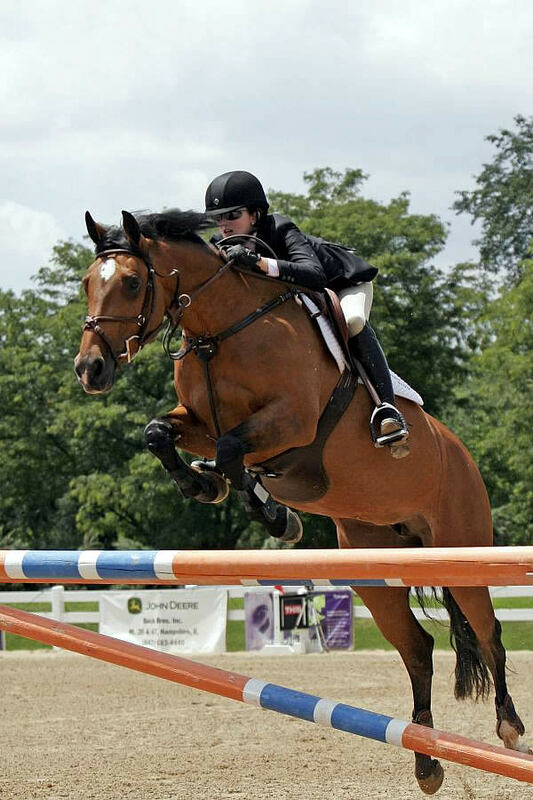 Lisa Goldman and Centurion B.
Wayne, IL – June 5, 2014 – The applause resounded throughout the Lamplight Equestrian Center as 13 horse and rider combinations faced off in the Showplace Spring Spectacular $20,000 Open Welcome Stake. It came down to a battle of speed as Lisa Goldman and Tracy Fenney went neck and neck, but Goldman and Centurion B came away the victors. Fenney laid down two impressive double-clear efforts for the second and third place positions with MTM Timon and MTM Centano, respectively. Goldman returned to the ring as the final rider to jump-off with her two mounts. She had produced clear efforts early in the class with Centurion B and Morocco, but had opted to return at the end in an effort to save her mounts’ energy after the long opening track. It was clear that she had her eyes set on the win as she took the opening oxer. She utilized Centurion B’s large stride, eating up the ground and shaving the seconds with tight turns. She made an impressive turn from the in-and-out to the oxer with Centurion B turning on a dime and leaving change as he spun to the obstacle. She then completed the inside track to the final vertical, breaking the beam in 34.609 seconds to take the lead. It was an emotional win for Goldman today, dedicating her tricolor to Fletcher McCracken, who passed away earlier in the week. Fletcher was married to Centurion B’s breeder, Allyn McCracken. Goldman was thrilled to have the opportunity to win the $20,000 Open Welcome Stake in his honor. The $5,000 1.30m Open Jumpers will take center stage tomorrow afternoon in the Grand Prix Ring at the Spring Spectacular I as riders from across the nation vie for the top honors. The High and Low Junior/Amateur-Owner Jumpers will also have the opportunity to prepare for the $10,000 Show Jumping Hall of Fame High Junior/Amateur-Owner Jumper Classic on Saturday, and the $10,000 NAL Low Junior/Amateur-Owner Jumper Classic on Sunday. For more information, please visit: http://www.showplaceproductions.com.